NATO, the biggest war machinery in human history is “celebrating” its 70th anniversary with a summit in Washington D.C., on 4th April 2019. The WPC opposed NATO from its founding days as the armed wing of imperialism. The history of NATO which is full of crimes,wars and aggressions proves us right. Since 2010, the WPC has been carrying out its campaign, “YES to Peace-NO to NATO,” with mass events around the world. We demand the dissolution of NATO and support the struggle of the peoples in each member State for the disengagement from it. We oppose the war drive policies and aggressions carried out by NATO in Yugoslavia, Afghanistan, Iraq, Libya, Syria, Yemen etc. and denounce the governments of the USA and all NATO states who have acted together and unanimously against the peoples of the world. Furthermore, we denounce the political and military actions of NATO hand in hand with the European Union, which is creating its EU army, while it is intervening alone or together with NATO in many missions abroad. The World Peace Council calls upon all members and friends to organize around the date of 4th April 2019 protests, rallies and other events in as many as possible countries, underlining the opposition to the aggressive mechanism NATO which is the enemy of peace and of the peoples. 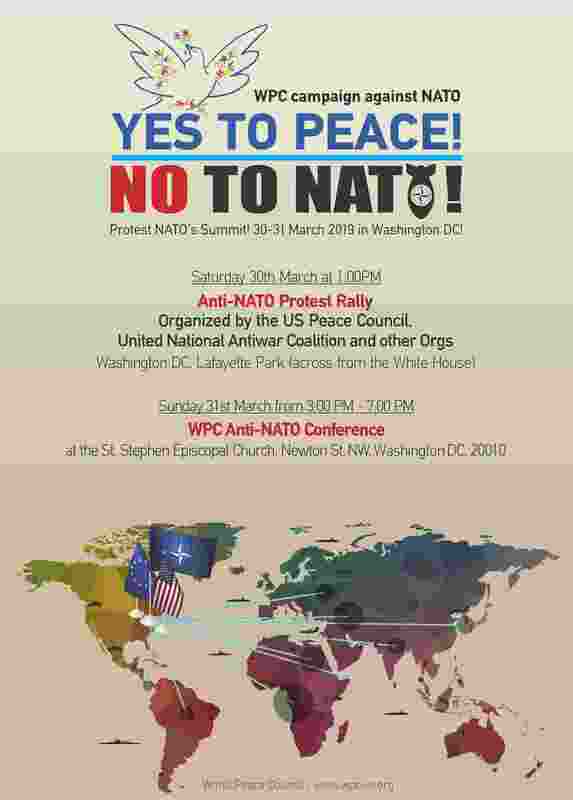 The World Peace Council will hold an Anti-NATO Conference on 31st March 2019 from 3:00 to 7:00 PM at the St. Stephen Episcopal Church Newton St., NW, Washington DC. 20010. We call upon all WPC members and friends to support and attend this conference organized together with the USPC and UNAC. For further details we kindly ask you to communicate with the WPC ([email protected]) and with the USPC ([email protected]). In case participants who intend to attend the events need US Visa, personalized invitations can be sent by the USPC. Technical support for matters of accommodation can be requested likewise. Down with Imperialism! Yes to Peace–No to NATO!